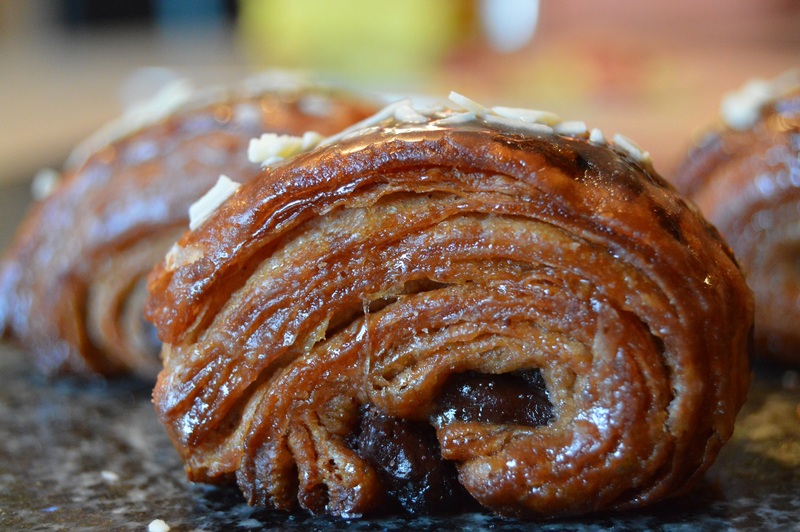 If you have ever been daunted by pastry, particularly for croissants and the like, these rich chocolate and ginger pastries are actually quite easy to make. Certainly compared to making croissant dough the traditional way. They also eat easily (perhaps too easily) at any time of the day but as with many pastries, they are perfect with a cup of tea or coffee! 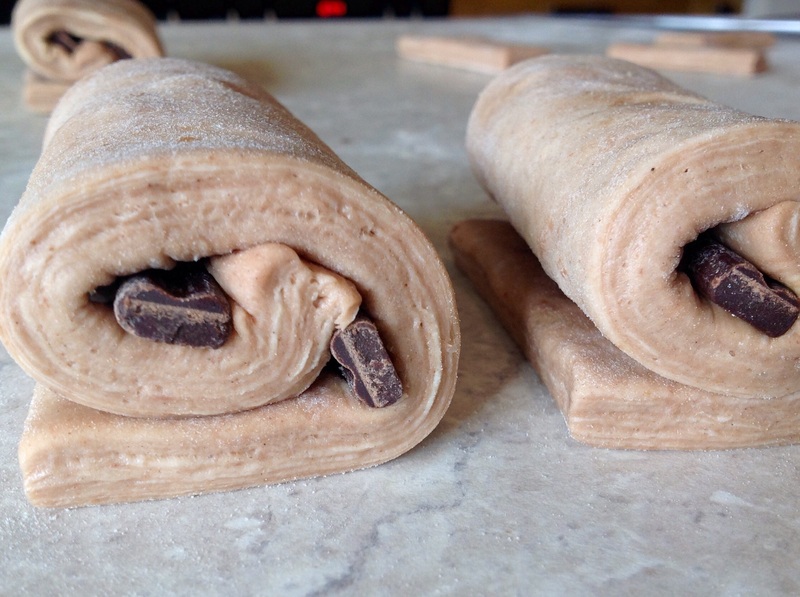 A croissant dough flavoured with cocoa and ginger! I love the combination of bitter dark chocolate and fiery ginger, so after an idea popped into my head (on the train of all places! 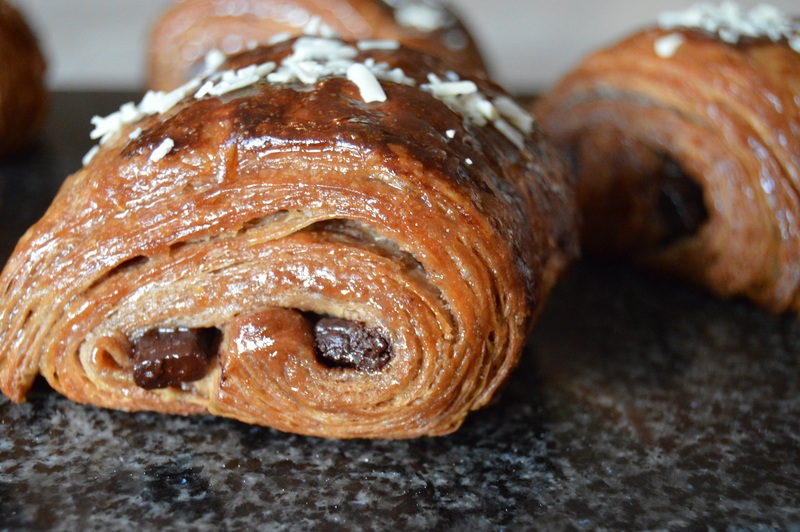 ), I decided to do another twist on croissants/pains au chocolat. 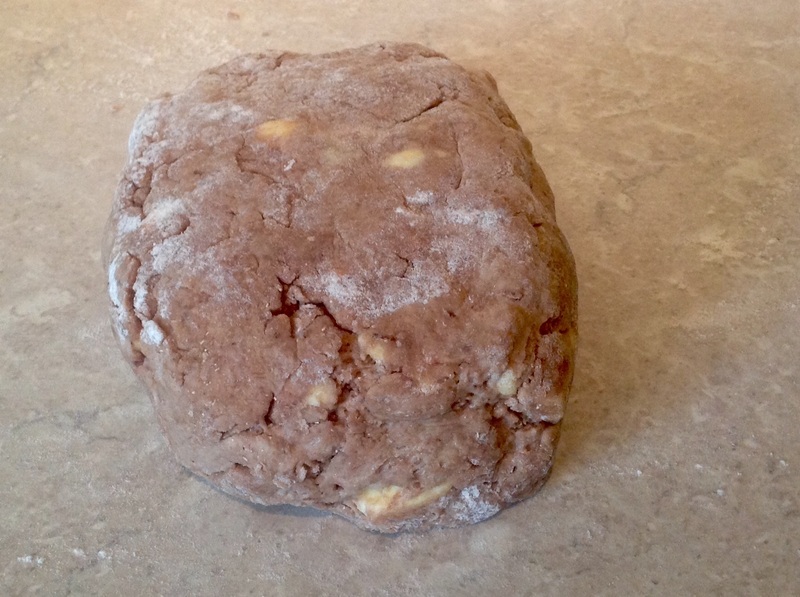 My idea this time was that I wanted the dough itself to have a chocolate and ginger flavour (courtesy of cocoa powder and ground ginger) as well as the more intense and gooey chocolate-ginger kick from the filling – coming unashamedly from dark chocolate and stem ginger! I decided to shape these as for pains au chocolat, making several large ones, along with a few mini ones using some of the trimmings. A sticky, ginger glaze makes these pastries taste even more indulgent: in my opinion there is something quite enticing about a sheen on pastries. I decided to add some grated white chocolate on top – mainly for a visual contrast, but I love the flavour of white chocolate! 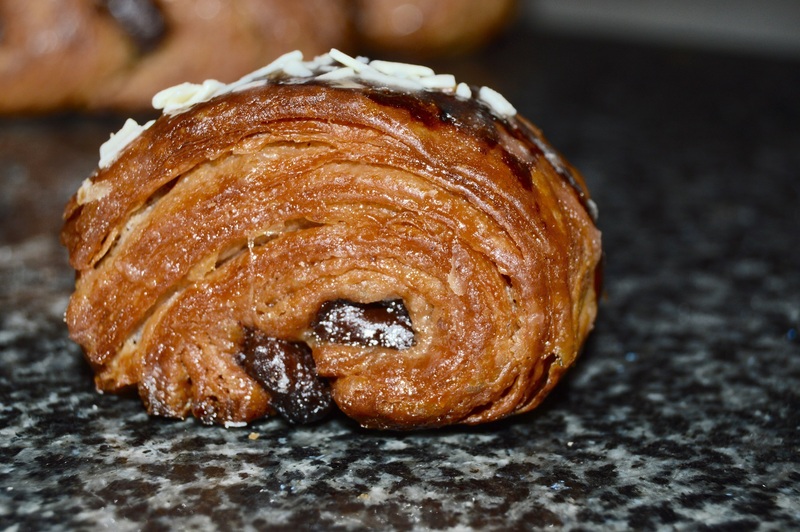 However, I usually stick to this recipe for croissants when making the traditional version. 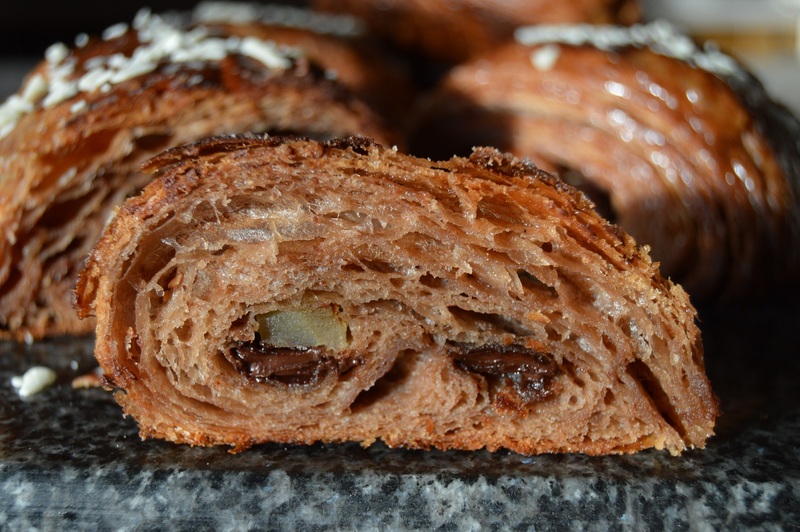 Full details for shaping croissants and pains au chocolat, regardless of which dough you use, are at that link. The rough-puff method I use in this particular recipe works very well indeed: as you can see from the pictures, the interiors have a nice level of honeycomb structure – always much sought-after with croissants and related bakes. The pastries flake all over the place (another must!) and they are buttery rich. (1) Sift the flour, ginger powder and cocoa powder into a bowl. Stir in the sugar, salt and yeast. Mix in the butter, lightly coating the pieces in the flour mixture. (2) Add most of the water and stir together with a knife until it just comes together to form a soft but not sticky dough, adding more water if necessary. 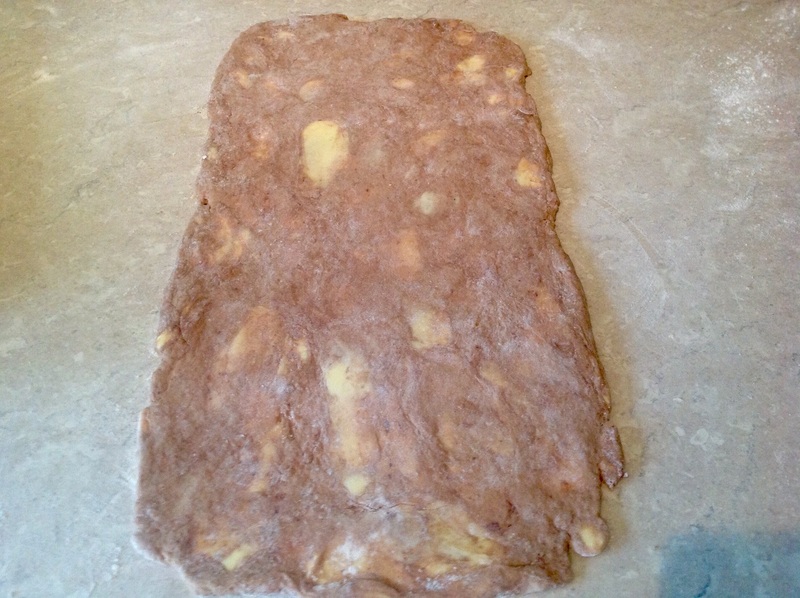 (3) Roll out the dough thinly on a floured surface to a rectangle about 8″ by 24″. Bring the bottom third up to the middle and the remaining top third over this. Cover with cling film and pop in the freezer for 20 minutes. 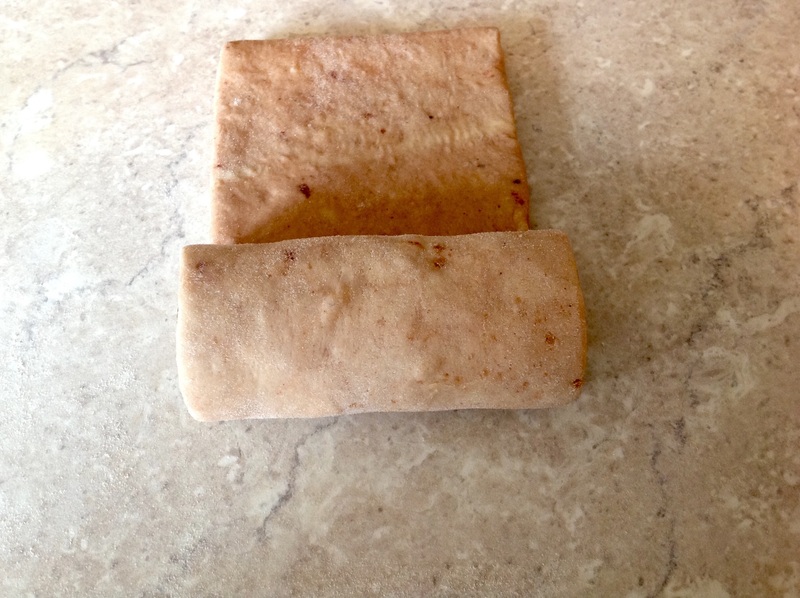 (4) Rotate the dough 90 degrees and repeat the rolling and folding two more times, putting the dough in the freezer for 20 minutes and rotating before each rolling out. Chill for a couple of hours, ideally overnight, before using. NB: you can freeze the dough at this stage. 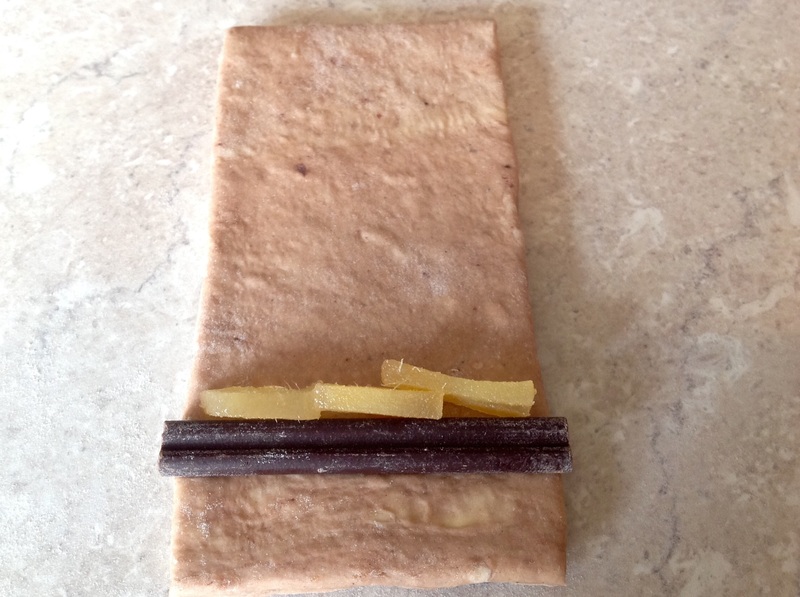 (5) Roll out the dough to a rectangle about 8″ by 30″ and trim the edges. Cut into rectangles about 4″ by 3″ – to give 20 of them – or go larger. (6) Shape as in the pictures below, using the chocolate and small pieces of stem ginger, rolling up fairly tightly as you go. Place on large baking trays lined with at least two sheets of greaseproof, with the seam underneath and lightly press down to keep each in place: this ensures they do not unfurl while they rise or bake. (7) Place the baking trays inside a large bag: a bin liner is ideal! 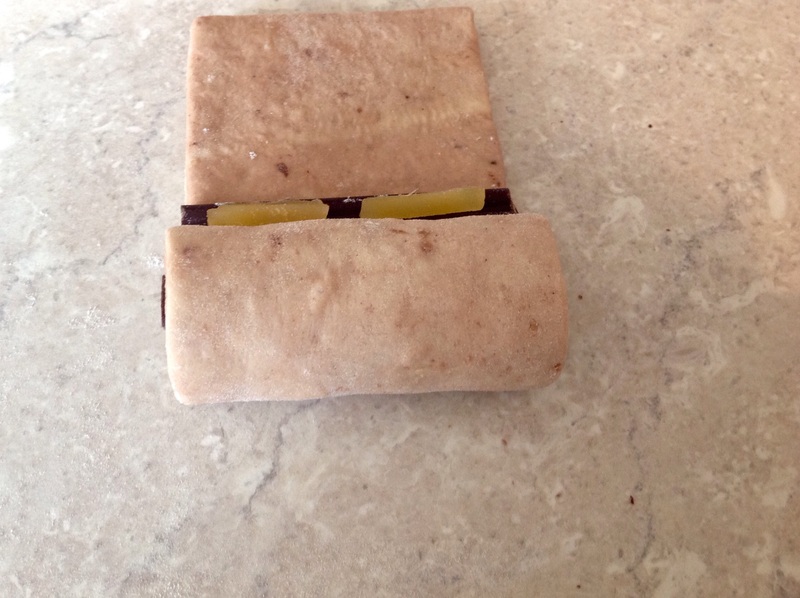 Make sure you have a gap between the plastic and the dough: placing a cup or tin inside will help. Prove at room temperature until almost doubled in size: you don’t want if to be too warm or the butter might melt. Towards the end of the rise preheat the oven to 200C(fan). (8) Brush the surfaces with the beaten egg and put in the oven, immediately turning down the temperature to 175C. Bake for 20-25 minutes: you will see those wonderful flakes and they should be a deep golden-brown colour, feeling crisp and very light. (9) As soon as they come out if the oven, brush generously all over with stem ginger syrup. Transfer to a wire rack to cool and sprinkle over the white chocolate. Full details for shaping croissants and pains au chocolat, regardless of which dough you use, are in the first of the two links above.